Xel-Há is an aquatic theme park where guests can snorkel, relax and enjoy the Caribbean waters in a safe, secluded inlet. The adventure park is located just north of Tulum in Mexico’s Riviera Maya, about a 1.5 hour drive south of Cancun. We have visited the Riviera Maya several times before, but we had not visited any of its amusement parks. After researching each one, and reading the recommended ages (our youngest is 4 years old), we decided to visit Xel-Ha and Xcaret on our most recent trip to Mexico. We will write about our experience at Xcaret in a future post. What activities are at Xel-Ha Park? There are plenty of adventure parks in the Riviera Maya, so why should you want to visit Xel-Ha Park? It’s a question we asked ourselves. 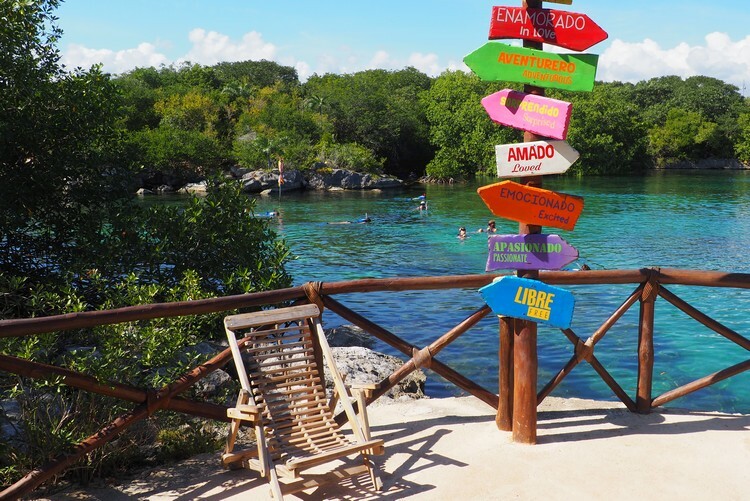 The main reason to spend a day at Xel-Ha Park is to get in the water and go snorkeling or swimming. The nature park has a large secluded cove that is protected from ocean waves, so it’s a safe environment for children (and adults) to get in the warm salt water and swim with colourful fish. Scenic Lighthouse – 100 feet tall tower with scenic views and water slides. River Tour – float down the river in an inner tube. Salpichanga Zip-Lines – single circuit with a total of six zip-lines. Trepachanga – walk over the river between two ropes. Chuck Kay’s Flight – fly towards the inside of the grotto on a rope swing. Mayan Cave – considered a sacred place, this is covered cenote. Cliff of Courage – rock climbing and cliff jumping. Cenotes – swim in two freshwater underground caves. Jungle trails – walk through the lush jungle trails of this nature reserve. Bike rides – bikes are available for guests to use. Children’s World – wading pool, playground, water slide, rope climb, seesaw, crocodile tunnel, hanging games, water lilies and turtles for climbing.